Hoop Nut #UAAP78 Juniors Division UAAP #UAAP78Jrs Roundup: Bullpups feast on Junior Archers in Game 1 of the Finals! 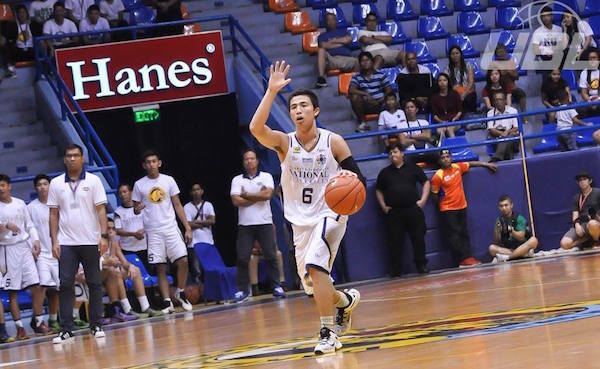 #UAAP78Jrs Roundup: Bullpups feast on Junior Archers in Game 1 of the Finals! Justine Baltazar and Karl Penano go up for the rebound in Game 1 of the #UAAP78Jrs FInals. 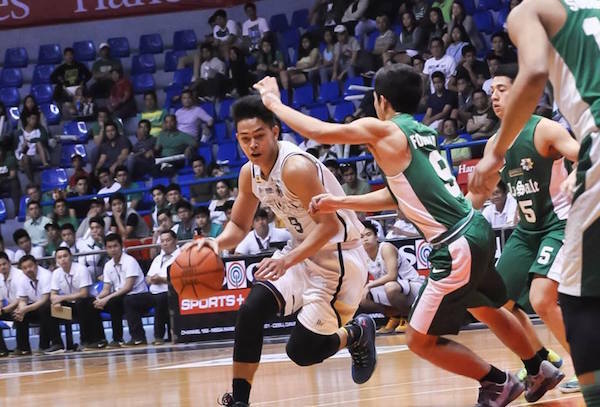 The NU Bullpups had practically no trouble in getting their fifteenth win of the season and moving just one win away from annexing the Season 78 Juniors’ crown after they demolished the De La Salle-Zobel Junior Archers, 78-58. Justine Baltazar was in his usual deadly form in leading NU to the big W. The native of Mabalacat, Pampanga recorded his 12th double-double of the season with 15 points and 27 rebounds. The 6’8 slotman celebrated his 19th birthday yesterday, but it seemed like it was just another day in the court for Baltazar, as he was simply determined to help the Bullpups to reclaim the throne. 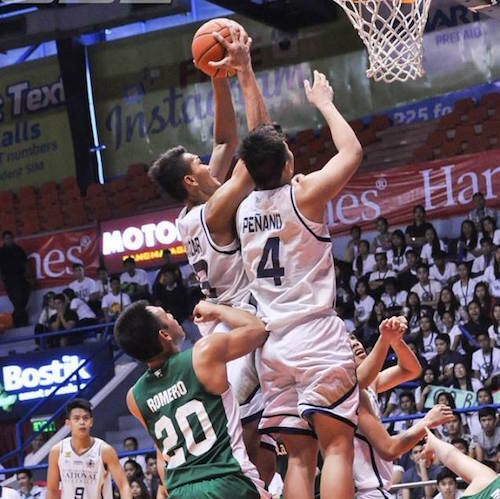 "May isang game pa na kailangan pa naming tapusin, go hard lang palagi," said Baltazar, who also swatted away four attempts. Extending their unbeaten run to 15 games, thrice-to-beat NU seeks to claim its third championship in four seasons with another win in Game 2, which is slated on Friday at the San Juan venue. Daniel Atienza has been doing a fine job as NU's main quarterback this season. After the Junior Archers scored the first two points of the game, it was an all-Bullpups show as they utilized their tremendous height and seize advantage to the hilt to dominate the Finals opener. "Yung mga bata, kung ano and gameplan, ginagawa nila. All-out lang kami," said NU mentor Jeff Napa, a former Bulldogs star who fired 10 three-pointers in one UAAP men's basketball game in 2002. Aljun Melecio, who will receive the season MVP award next week, paced La Salle-Zobel with 15 points, seven rebounds, and six assists. Marco Sario had 10 points, eight rebounds, and three assists, while MR Romero also tossed in 10 points for the Junior Archers, who trailed by as many as 31 points. 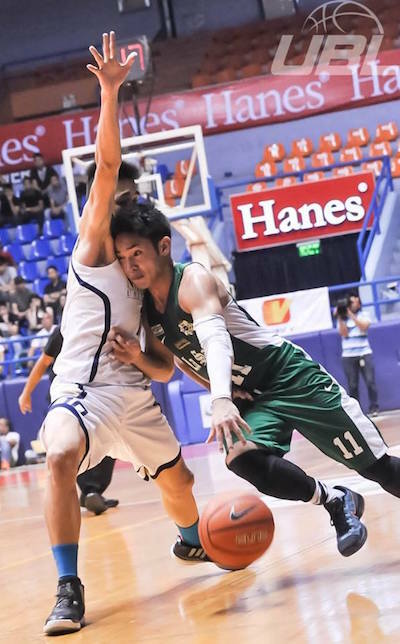 DLSZ superstar Aljun Melecio was severely limited in Game 1. NU drew good production from another Pampanga product, John Lloyd Clemente. The lanky wingman led the Bullpups in scoring with 16 points on top of 8 boards. Karl Penano also did well, dropping a dozen markers. John Lloyd Clemente was match-up nightmare for the Bullpups. All images are from the University Basketball League.